When we were planning our video series, we first had to decide between doing a comprehensive walk-through of our system from beginning to end or putting together something small and potent that gets straight to the good stuff. The latter sounded more exciting to us so that where we began. This workshop is a crash course for our favorite and most effective techniques. We hope you’ll find this toolkit of five amazing manual therapy techniques to be as useful as we intended. We do this work every day in our offices. People who visit us have a wide variety of dysfunctional patterns but as any bodyworker knows, there are always a set of techniques you use for every single client – because they simply work – and because nearly everyone that walks through that door with back or neck issues have dysfunctions in these same trouble zones. The value we’ve placed on the workshop is amazing. We can’t emphasize that enough. Please watch our demos. Call us. Write to us. Or come visit us. The efficacy of our work shows in every aspect of what we do from the clientele walking out of our offices to the responses our students get from theirs. 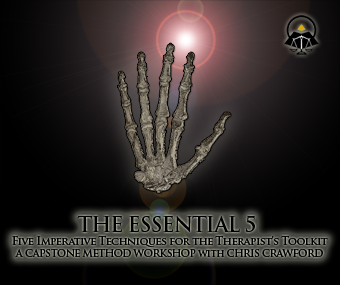 The Essential 5 is our manual therapy video “powerpack”. We hope you check it out and benefit from it. Included in the purchase of this download is 3 months of free online support. This means you are welcome to email us with any questions and we’ll make sure you get the answers. Beyond 3 months, as long as it’s reasonable, we’ll probably be there if you need us anyway. Enjoy these videos! This entry was posted on Wednesday, May 11th, 2011 at 5:43 pm. It is filed under Online Workshop Products, The Essential 5 and tagged with bodywork demos, bodywork video, essential 5, essential five, learn structural integration, manual therapy training, manual therapy videos, massage school, muscle energy techniques, neuro-muscular programming, online bodywork demos, rolfing, structural integration, structural integration classes online, structural integration videos, the essential five. You can follow any responses to this entry through the RSS 2.0 feed.